What’s your favourite animal? 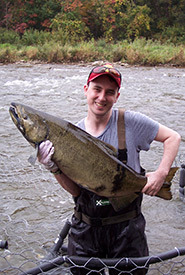 It’s a common question for many of us with a fascination for wildlife and a passion for conserving the natural world around us. When I answer that my favourite species is American pika, some people are surprised, but many (where I live in southern Ontario, at least) have never heard of it. Indeed, it was only after I chose to focus on the species for a university research project about the impacts of climate change that I fell for this small mammal. 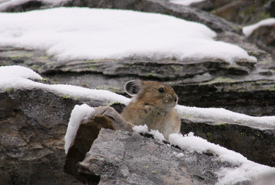 With its large, rounded ears, stout body and short limbs, it would be easy to mistake a pika for a rodent. In reality these small, herbivorous mammals belong to the order Lagomorpha and are more closely related to rabbits and hares. Two species of pika call Canada home: the American pika occurs throughout the Rocky Mountains, while the northern collared pika calls the mountainous regions of Alaska, northern BC and Yukon home. Pikas don’t hibernate; they remain active under the snow and in their dens throughout the winter. In preparation, they cache grasses, sedges and other plants in a behaviour known as “haying.” This food store is vital for its survival during the long, cold winters in high-alpine mountain slopes. Living exclusively among rock fields and alpine meadows above the treeline of the Rockies, the American pika thrives in a habitat where few other species are able to survive. 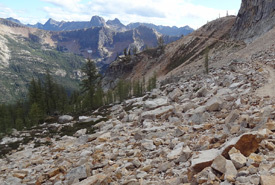 In Canada, it can be found in southern BC and Alberta at the edge of subalpine forests and alpine meadows, relying on small patches of meadow grass that grow at higher elevations. These seemingly innocent mammals are highly territorial. Despite living in family groups known as colonies, individual pikas will push out any competitors within 500 square metres. Given their specialized foraging requirements and need for a large amount of land where colonies can spread out, the amount of habitat available to pika populations is limited. Pikas are well adapted to cold, alpine habitats, and often overheat when temperatures reach 25 C or higher. As climate change increases the global temperature, and instances of extreme heat events become more frequent, the American pika is facing increased pressure throughout its range. Research shows that pika populations have been decreasing rapidly in the Great Basin (a segment of the Rockies that extends through parts of Nevada, Oregon and Utah), and the species is experience increasing environmental pressures further north. As temperatures warm, some tree species are expanding higher into the mountains, causing the American pika to retreat further and further toward mountain peaks, reducing the amount of habitat area available to pika populations. 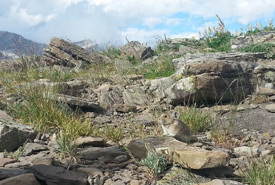 Given the increased risk of predation and heat exhaustion, pikas don’t regularly venture into the forested valleys that connect mountain outcrops throughout the Rockies. As a result, it is difficult for them to migrate between mountain peaks, and colonies are often trapped at high elevations on small islands of habitat in an ocean of forested land. Due to this isolation, the genetic pool of these pika populations can become restricted, and inbreeding can become an issue within colonies. Few species are as directly or graphically impacted by warming global temperatures, and, for this reason, the pika has been pointed to as a harbinger of climate chance. In fact, the northern collared pika was assessed as special concern by the Committee on the Status of Endangered Wildlife in Canada in 2011. But there is hope. 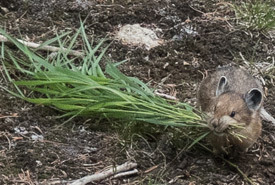 By monitoring pika populations their range and by instituting capture and release programs, it may be possible to help combat inbreeding and the loss of this charismatic resident of the Rockies.